There is very subtle silver laced through the white. The texture is truly lovely. The only complaint I have is that it is almost ivory in color rather than a pristine white. It isn't obvious unless it is next to a pure white. Echelon Home's textured euro sham with tassels is made with cotton and subtly accented with silver lurex threads for a hint of luxe. 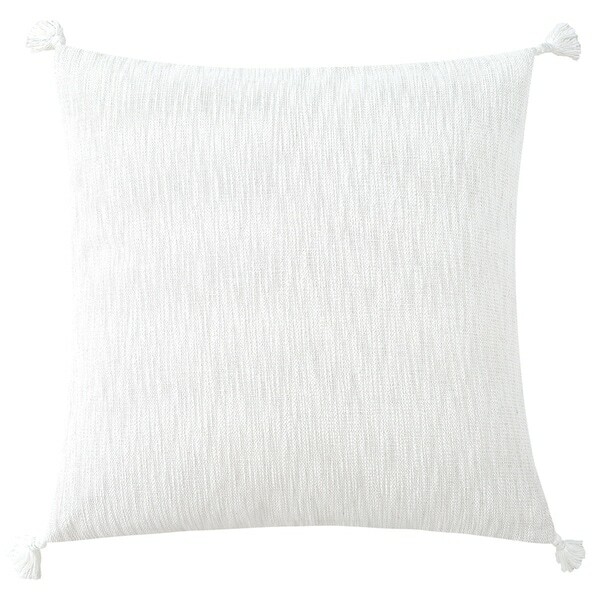 I purchased these pillows as back shams for a bed and they look great! They complement the other bedding and the tassels add a nice touch. I would definitely purchase them again and highly recommend! These euro shams are really cute! They’re soft and the touch of gold threading to the white sham, along with the tassels, really adds an element of glam. They look great against the our navy bedding. These are so beautiful in person! I was very pleased when I opened the package. I wanted something that would coordinate with whatever bedding I happen to use, and the gold accents in the pillow are just the perfect little detail. I’m absolutely obsessed! I am very, very happy with the look of these euro cases. There's actually a silver stencil throughout the pillow adding a very subtle, but noticeable sparkle which I LOVE. I rated it 4 stars because the tassels after washing became a bit complicated by shedding and tangling. I would purchase again. Quality is amazing. Looks amazing on my bed. The white is brilliant.